I recently finished reading Brene Brown’s new book, Braving the Wilderness. Perhaps for that reason, I have been thinking a lot about belonging. I remember having a conversation with my brother, years ago, about how in any given group of people, I felt like an outsider in one way or another. I’ve wondered since then if that was unique to me or if, as I suspect, most other people feel the same way. 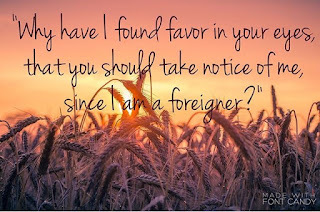 I’ve been reading the book of Ruth this week, and the word “foreigner” stood out to me. As the Moabite widow of an Israelite, Ruth made the surprising decision to forego returning to her homeland after her husband’s death in order to remain with her widowed mother-in-law, Naomi. Together, they returned to Bethlehem once the famine there had ended. Soon after, Ruth met Naomi’s wealthy relative, Boaz. 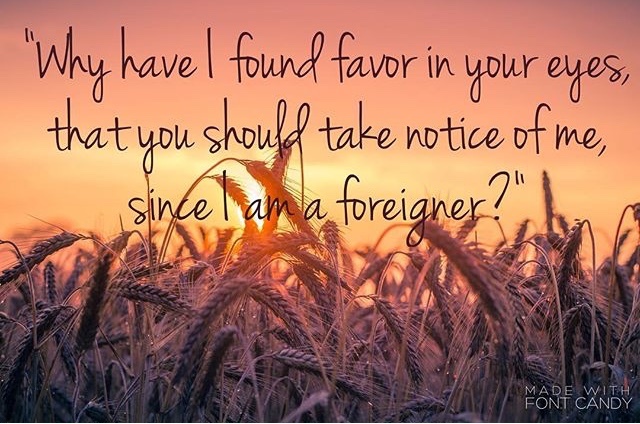 When Ruth first met Boaz, who offered Ruth food and protection, Ruth asked, “Why have I found favor in your eyes, that you should take notice of me, since I am a foreigner?” (Ruth 2:10). The land, people, and God of Israel were all foreign to Ruth, and her question seems to indicate that her identity as a foreigner was at the forefront of her mind, as something that should have disqualified her from Boaz’s favor. Ruth’s identity and situation made her vulnerable several times over—as a woman, a widow, and a foreigner. The Bible speaks over and over of the Lord’s directive for His followers to care for the most vulnerable people in society: the widow, the orphan, and the foreigner, among others. Jesus Christ, Himself, seemed to go out of His way to spend time and build relationships with women, children, sinners, tax collectors, outcasts, the sick, the poor, and the unclean. He loves all of His children, but I think it’s safe to say that He has a soft spot for the most vulnerable. This takes active, intentional work on the part of the privileged. Boaz, privileged as a man and as a wealthy person, saw Ruth, noticed her, inquired about who she was, and initiated conversation with her. He honored and elevated her with his kindness. He helped her with his offer of food and protection, but he also listened when she communicated what she needed through what was basically her very bold proposal of marriage (Ruth 3). I’m not sure what parts of your identity, past, experiences, shortcomings, failures, etc. make you feel vulnerable, but God sees these parts of you clearly, knows them intimately, and cares deeply. He is the Father to the fatherless, the defender of the weak (Psalm 68:5). I believe that an important step in helping others is to experience our own healing so that we have the courage and security we need to take the risks involved in loving others well. When we are coming from a place of security, we can see others more easily and show compassion more readily. We are freed up to move beyond our own pain and enter in to the pain of others. We can listen openly, without offering judgmental or defensive responses. I too have felt like an outsider--and I am finding more and more I am not the only one! Thank you for this Biblical reminder that God calls us His, that we belong. I love this perspective on Ruth! I had never noticed the identity shift she made. This is beautiful! Thanks Heather! My study Bible helps me notice nuances that can be so meaningful! I love how rich His word is.